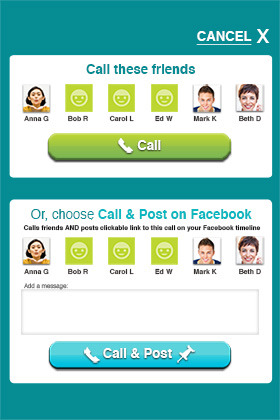 CallFriends is your customized social phonebook. and your schools into 1 simple click-to-call app. You've already created your social network. We organize it for you and add mobile group calling with a click. No more phone numbers. CallFriends group calls are like a conference call with friends and family. You click, and everyone's phone rings. Instantly, you have a new and fun way to call up to 6 friends on a single mobile call. CallFriends is for US mobile phones only. Have fun. Call friends. Bye! Super easy mobile calls to your groups of friends, family, teams, carpool...with one click. Ever wish that you could shout out to Mom on her birthday with your brothers and sisters on the same call? Now you can. Want to let the carpool know you are running late? So easy. Grab your BFFs for a spontaneous dinner - click - done. Experience new call controls at your fingertips. As the originator of the call, you can recall yourself or anyone on the call if the mobile call should drop. 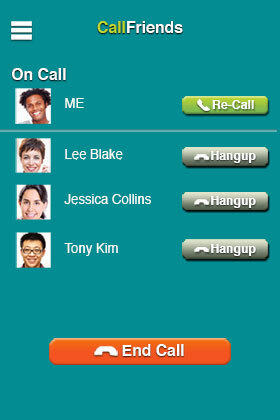 Your call dashboard has the profile pix of who is on the call with you. You control when the call ends. Try social calling! A brand new way to talk with friends. Choose to Call & Post when you want to open your call to interaction. A live link to join your call will post on your Facebook Newsfeed. Of course, you control who sees your newsfeed and who is allowed to click in. Way to start a party call! CallFriends is a mobile phone group calling and conferencing app. 2. Is CallFriends free to use? When you make a call, only your regular carrier charges apply, nothing extra. Just select friends to call. Your mobile rings and so does theirs. Answer, press 1 and you're in the call. Totally. We never share your information with any 3rd parties. 5. Why all the Facebook permissions? No worries. We're not nosy. We needed the permissions to organize and include all the groups, events, etc that you have already added to Facebook. No funny business. We promise. 6. Who can I call? You can call anyone who's mobile number is in your contact list and Facebook friends who also have the app. 7. How many people can be on the call? Welcome to a new experience - you can call up to 7 on one mobile call - you and up to 6 others. 8. What does Call and Post mean? You have the option, when you start a call, to post a live clickable link that appears in your Facebook newsfeed. Other friends who see this can click and join your call! You control who sees the link. You control who is allowed to join in the party call. 9. What happens if my calls drops, or another person's call drops? Mobile phone calls drop - it's a fact of life. With CallFriends, we have a solution. The call orginatior has "recall" controls and can ring themselves or anyone else back into the call. 10. Is CallFriends US mobiles only? Yes. But international calling is in the works.